The winter is approaching but it doesn’t mean you have to give up on exploring outdoors with your baby! 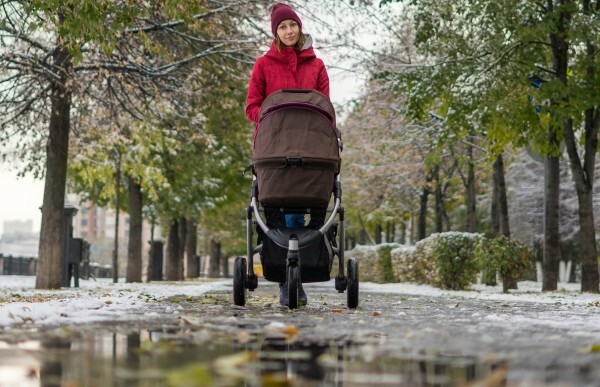 You just need a proper winter stroller that will handle snow and slush. How to choose safe and high-quality stroller for snowy roads? There are few things that make a stroller suitable for winter walks – you’ll learn about it in this article. I know that some of you are looking for a stroller only for snowy sidewalks, while others would prefer model that handles snowdrifts. And of course all parents have different budget for this piece of baby gear. That’s why I present here 3 different strollers in a wide price range and suitable for different amount of snow. The strollers that I recommend for snow are: BOB Revolution FLEX, Bumbleride Speed and Baby Jogger City Mini GT. 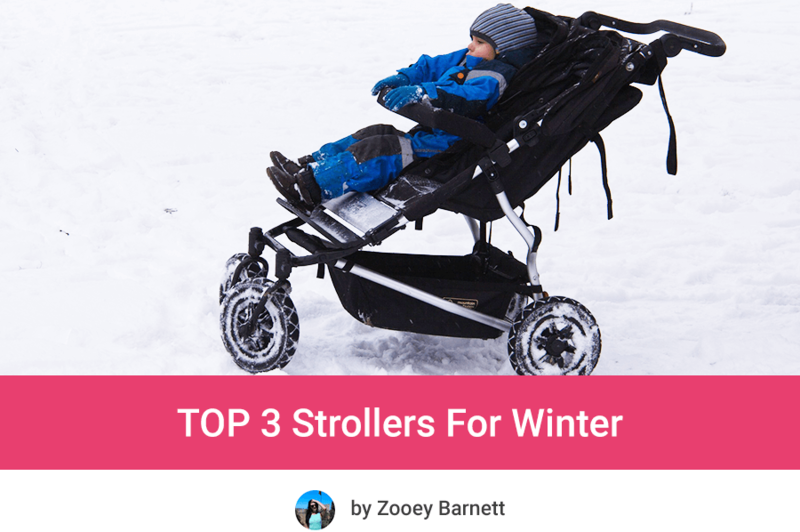 Keep reading to find out what makes them the best strollers for winter and choose one of them that suits you best. Without further ado, here is the list of features that make stroller more easy to push through the snow. Generally speaking strollers that have three wheels instead of four are easier to push on rough terrain, including snow. It makes the stroller easier to operate, as well and more agile and maneuverable. Another important thing is the front wheel – swivel and lockable one is ideal. By locking the front wheel you make the wheelbase longer and sturdier. It will be much easier to go over snowy sidewalks and you won’t get stuck. In general, all jogging strollers with lockable front wheel will do fine on snow, but here I will recommend two models that lots of parents praise for exceptional performance on slush and snowy roads: Bumbleride Speed and BOB Revolution FLEX. Of course you can choose any other jogging stroller (with swivel/lockable front wheel) that I reviewed in my ranking of joggers and it won’t disappoint you on snow. I’m aware that not every parent can afford a jogger or simply don’t want to have a big and heavy stroller. There’s another solution. There is also one standard 3-wheel stroller that can handle winter weather – Baby Jogger City Mini GT. If you live in area where winters are not so rough, four-wheel stroller with big foam tires will probably work fine as well. Lots of parents use Baby Jogger City Select, UPPAbaby VISTA or Bugaboo Fox on snowy sidewalks and they are satisfied with their performance. But if you’re looking for a stroller that will handle tons of snow, iced paths and slush, choose a model that meets the requirement that I mention here. The bigger the wheels the better. Look for a stroller that has at least 8″ wheels. This means that lightweight strollers are not a good choice for snow – most of them has 5″ wheels. For winter weather choose a standard model marked as “all-terrain” or a jogging stroller. Tires are also very important. Air-filled ones are the best because they roll much smoother. This makes stroller easier to push and the ride is more comfortable for the baby. Both BOB Revolution FLEX and Bumbleride Speed meet all of these requirements. They have 16″ rear wheels and 12″ front wheels. Tires are filled with air and you should pump them once in a while to keep them in a good shape. Depending on the amount of snow, wheels with big rubber tires filled with foam should also work fine (Baby Jogger City Mini GT with 8.5″ wheels roll on snow really well). But if there’s really a lot of snow in your neighborhood air-pumped tires are a must have. I don’t recommend strollers with hard plastic wheels or almost flat tires. Strollers with dual front wheel (e.g. Britax B-Agile or Baby Trend EZ Ride) are also not a good choice – you will get stuck in snow for sure. Going through snow means your little one will be more exposed to shocks. If you don’t want your baby to shake and bounce too much, choose the best winter stroller with suspension that will smooth the ride. Currently lots of strollers have good suspension system – you can find it not only on joggers, but standard strollers as well. All three strollers that I recommend here are equipped with shock-absorbing suspension so you can be sure your baby will have a pleasant ride. During your stroll or run it may start snowing so your winter stroller has to have a big canopy to keep your baby dry and warm. Oversized canopy will also protect baby from wind and catching a cold. 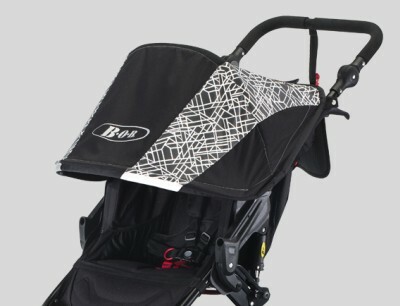 BOB Revolution has huge extendable 2-panel canopy that covers baby’s face and torso. Bumbleride Speed has 2-panel shade as well, but additionally there is pop-out visor. Your child will be well protected from snow and rain. 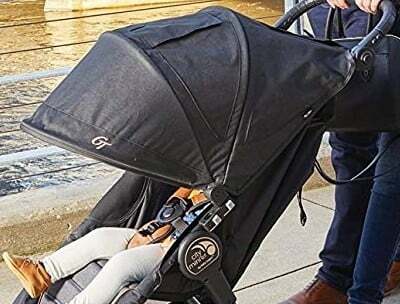 Baby Jogger City Mini GT has long 3-panel canopy that covers baby down to the waist. Parents love Baby Jogger City Mini GT huge canopy. And it has TWO peek-a-boo windows! Performance on snowy roads is not the only thing that you should consider when choosing a winter stroller. Wide, roomy seat and possibility of attaching a footmuff are also very important. During winter strolls your baby will be wearing more clothes and bigger jacket and you’ll probably want to cuddle him in a blanket. That’s why the seat has to be roomy so the baby could feel comfy and warm in it, without being squeezed. Adding a footmuff is also very useful. Baby Jogger and Bumbleride offer footmuffs designed specially for their strollers. For BOB jogging stroller you can add an universal footmuff (for example this one). Psst! There’s one more useful accessory for fans of winter strolls: a hand muff. My babies don’t like mommy’s cold hands and definitely don’t like gloves. So this accessory has been very handy for us. Here you can see Baby Jogger hand muff. There are also other, universal hand muffs that fit majority of strollers (check this one for example). I’m debating between city mini gt amd britax bfree. Live in snowy climate. Any preference? I prefer City Mini GT because of the wheels and suspension quality. Plus the canopy is so generous, it will protect the baby from the snow really well. Hello thanks for the breakdown- can you advise on best period to purchase…. baby turning 1 and I had a travel system stroller that’s super heavy especially when I’m alone it’s a hassle. Looking into the city jogger mini gt model bc it seems more lightweight and folds smaller. I have been going back and forth in deciding what stroller to purchase for my winter baby in Canada because i use the public transport very often and it snows a lot where i live. I would like one with big tires to get through the snow easily. I have considered bumbleride indie, thule urban 2 and bob revolution flex. Hi and sorry for late reply! If you’re not going to run with your stroller or use it on mountain trails I would recommend Indie. It’s most compact and most lightweight model among these three strollers. It’s narrower than BOB and Thule so it will be easier to get on the bus with it or navigate it through crowds. Besides, it folds up easily within few seconds in case you need to fold it in a bus or train and it has smaller fold than other strollers. It weighs only 24 lbs which is pretty light (when compared to BOB which is 28.5 lbs) which also makes it easier to bring it on the public transportation or carry up and down the stairs in metro station or lift to the car trunk. It has pumped tires, each wheel is 12″ which is enough for snow and rough surfaces like gravel, grass, unbeaten roads etc. One more thing – if you’re going to buy Indie, choose the newest model (2018) because it has improved canopy which gives the baby more head room. If you plan on running with your stroller or stroll in hilly area you should think about getting more heavy-duty jogging stroller like Thule with additional hand brake. I’m expecting in February in Canada and have been going back and forth on strollers for what feels like weeks now! I have a dog and live close to a park with a mix of gravel and not at all maintained trails but they’re fairly flat so walking dog and peanut with an all terrain stroller should be very manageable. But, I also live in a city and will certainly use a mix of my very small car to transport the stroller and public transportation to get around. It doesn’t snow a lot where we currently live, but I wouldn’t be surprised if we move somewhere with significant snow soon. So I’m wondering what you would recommend that is good at off-road/all-terrain, but also small and maneuverable enough for buses, and folds nicely to get into my small trunk. I’ve been debating between Uppababy Cruz or Vista (love the bassinet option but perhaps not as good at other things), Quinny Buzz Xtra 2.0, Mountain Buggy Terrain, Bumbleride Indie, and so many more, lol. Bonus features would be bassinet option, forward and rear factin options, but the combo of all-terrain and city buses/small cars is much more of a concern. Help! Vista and Mountain Buggy Terrain have bigger fold (especially the Terrain is quite bulky). Besides, Vista is the most expensive option. I would definitely consider Bumbleride Indie or Baby Jogger City Min GT – depending on how much you want to spend on a stroller. Indie is suitable for all types of terrain, maybe just not very loose and deep sand, but it will handle snowy sidewalks, snow in the woods or gravel paths with ease. Just check this video – it goes even through very deep snow! https://www.youtube.com/watch?v=kBkvPMLYpEY It has good suspension, perfect for off road walks or even jogging. Indie can be used with bassinet (it’s sold separately, stroller + bassinet cost about $750). Fold is surprisingly compact (about 32 x 24.5 x 11.5”), you can also take off the rear wheels to make it smaller (it would be 19” wide, instead of 24.5”). Compare these dimensions with your car trunk. It weighs 24 lbs so lifting it to the trunk is definitely doable. Baby Jogger City Mini GT would be my second choice. It’s a bit lighter (22.5 lbs) and has smaller fold (29.5 x 24.2x 10.2”), but it has also smaller wheels (8.5” and not filled with air). They are good for almost every type of terrain – gravel, grass, few inches of snow on sidewalks, but not tons of snow 🙂 If you need truly all-terrain stroller that handles all bumps smoothly – go for Indie. City Mini GT can be used with a carrycot too (stroller + carrycot cost about $500-$600). These strollers unfortunately don’t offer rear-facing. But I wouldn’t pay extra just for this one feature (e.g. VISTA has reversible seat, but it’s also bigger and heavier). Oh, and if you’ll decide to go with Bumbleride Indie, I would recommend choosing 2018 model because it has improved canopy that gives more headroom for growing child. Are there any strollers out there that allow for rear-facing babies that also perform well in snow? Hi! If you don’t have to get through tons of snow Baby Jogger City Select should be sufficient 🙂 It has big wheels with forever-air tires + suspension that cushions the ride. It can handle snowy sidewalks and paths in parks. The seat is reversible so the baby can face you or the World. Hi, can you recommend a double stroller that would work well in the snow? It has to be able to accommodate a newborn and a 4 year old. NY winters can be bad and we’d probably be walking through snow drifts and unshoveled sidewalks. If you like long distance walks and the snow is really deep and loose I would recommend getting a 3-wheel jogging stroller. The best option is BOB Revolution Flex Duallie. It has large wheels with pumped tires which easily handle deep snow on sidewalks or trails. This one is a beast 🙂 And thanks to 3-wheel design it’s easier to steer and more agile. Flex Duallie will fit a 4 year old, for a newborn you will need to add an infant car seat (on PishPosh Baby you can find adapters for: Britax B-Safe, Chicco, Graco and Peg Perego car seats). There is no bassinet option. The main seat is suitable for infants who can hold their can up (about 3-6 months). This stroller has amazing suspension so even if the road is bumpy, the kids will be protected from shaking and won’t get hurt. Flex Duallie weighs about 33 lbs. There are also other options but with some things to consider. Bumbleride Indie Twin – it has 4 wheels, but quite big and the tires are also air-filled so it works fantastic on snow. The suspension is noticeable too. This stroller allow you to attach infant car seat (from Maxi-Cosi, Cybex or NUNA) or a bassinet (sold separately). The main seat reclines almost fully flat so if you add an infant insert you could start using it pretty soon. There are two things to keep in mind though: This stroller weighs 36 lbs and the main seat is 23″ long (from the bottom of the seat to the top of the canopy) so your 4 year old may fit, but I’m not sure how long it will serve you… I don’t not how big is your kid but usually parents use this stroller up to 4 – 4.5 years for average in height kids. One more thing – if you decide to purchase this stroller, choose 2018 model because it has improved canopy design to give the baby more headroom. 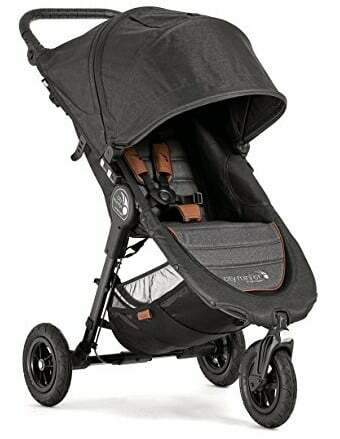 Baby Jogger City Mini GT Double – this is probably the best option for older and tall kid (about 26″ from the bottom of the seat to the canopy). This stroller weighs about 32 lbs, of course if you add an infant car seat or bassinet for your newborn baby it will be heavier. It has smaller wheels (8.5″) with rubberized forever-air tires. 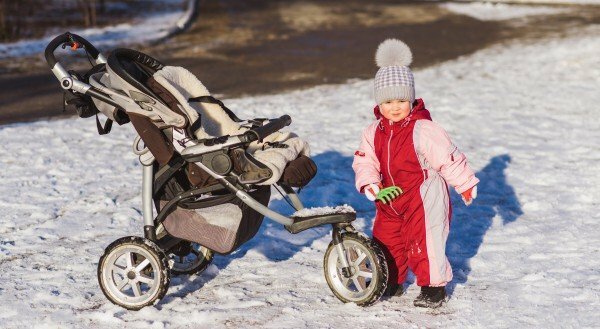 They can handle snow, but if it’s really loose and viscous the wheels may get stuck (with every stroller you need to remember about cleaning the wheels from the snow, but with smaller wheels it’s even more important). If you plan on using the stroller only on snowy sidewalks (not in the woods etc.) it may be actually sufficient. Baby Jogger City Select – This is not a double, but expandable stroller. I decided to recommend it too because I’m not sure how long your 4 year old would like to ride in a stroller 🙂 This model can be used as a single (smaller, easier to maneuver) or double (toddler seat + bassinet or infant car seat). You can also attach a standing board for older kid as well. It can handle snowy pavement too, but if the snow is more loose and sticky the front wheels (8″) may get stuck a bit. So just like the City Mini GT, this model would be great for winter too, but not for tons of snow. 4 year old should fit in the seat (under the canopy), however his/her head will be probably partially or fully above the backrest so he/she may not be able to recline and nap. Weight: 29.5 lbs with one seat. I hope you could write me back. Thank you! Hi Genille, I will do my best to help you! Frankly, it will be hard to find a stroller that meets all of your requirements 🙁 Stroller that works well on snow + bassinet cost more than $300. You will probably have to give up one feature or you’ll need a bigger budget. I will try to show you all available options and things you should consider before your purchase. First of all, what do you mean by “winter use”? Do you mean only colder weather or do you mean strolling on snow? Cheap strollers usually have foam wheels which are very flat and smooth and have no traction. So, do you really need stroller for snow? One more thing – bassinet is an option only for the first 6 months (maybe a bit longer). Because of that, some parents don’t buy it and use the stroller with infant car seat during the first months. It’s not a perfect solution, but if you’re on a tight budget it’s something to consider. Infant car seat is not good for long strolls, but you can use it to go to the grocery store or for a short walk. For snow you’ll need an all-terrain wheels with air-filled tires or at least rubberized tires that are filled with foam and have tread. There are few options under $300 that you can consider, but these strollers don’t include bassinet in the price. 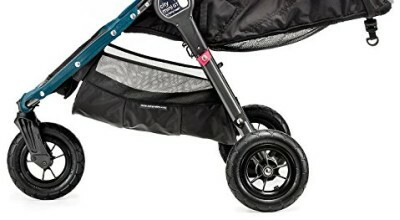 I can recommend you Baby Jogger City Mini GT (I descired it in this article) – it has 3-wheel construction and rubber tires and you can use it on snow without any problems. When it’s on sale it usually costs about $300. But it doesn’t include bassinet and the seat doesn’t recline fully flat for a newborn baby. You will have to purchase the bassinet separately (it costs about $160-$200). 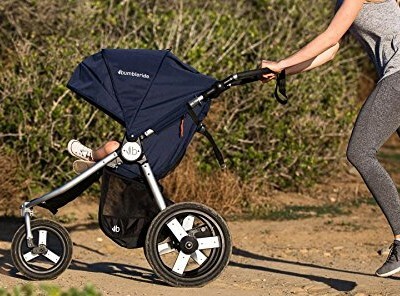 Of course you can also choose a cheap jogging stroller (like Graco Fastaction Fold Jogger) with air-filled tires but you could use it for newborn only with an infant car seat, since there is no bassinet for that stroller. If you’re not going to use the stroller on snow you can go for something cheaper with foam tires. For example Evenflo Pivot Modular – it costs less than $300, comes with a car seat and the regular seat converts into bassinet for a newborn baby. But since it has small, smooth wheels it’s good only for even terrain, definitely not for snow. I’m here for you if you have more questions!